It’d the perfect time to add a little spice to your kitchen creations. Find out how to make our favourite Loaded Fries, made with Tandoori Paste. 1. Make dressing by mixing all ingredients in a small lidded jar. Shake well and store in the fridge until ready to use. 2. Preheat oven to 190°C. Line a large rimmed baking tray with baking paper. 3. Wash and peel the potatoes. Cut into thin matchstick shapes. Lay potatoes on kitchen paper towels and press more paper towel on top to absorb all the moisture. 4. Place cut potato in a large bowl. 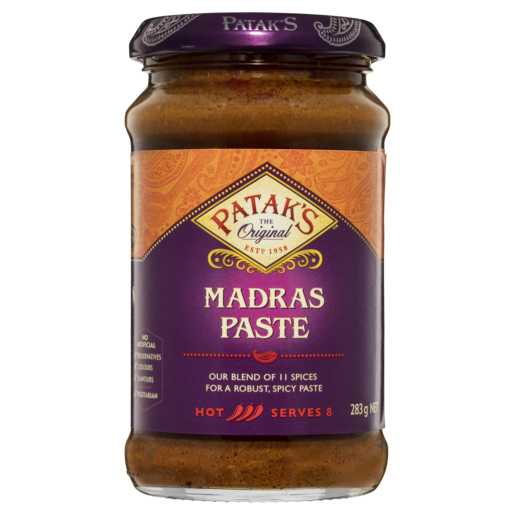 Add Patak’s Tandoori Paste and olive oil. Mix well until evenly coated with the paste. 5. Spread potato on prepared baking tray ensuring they are not crowded and touching each other. Use two baking trays if needed. 6. Bake in pre-heated oven for approximately 35-40 minutes until cooked and edges are starting to char and crisp up. 7. Remove from oven and place on shallow serving bowl in a heap. Top with onion rings, tomato, coriander and mint. Drizzle generously with yoghurt dressing. Dollop Patak’s Mango Chutney and garnish with crushed Patak’s Mini Pappadums. Serve hot. This delightful korma vegetable stack only uses a few simple ingredients, but creates scrumptious flavours for the whole family to enjoy.